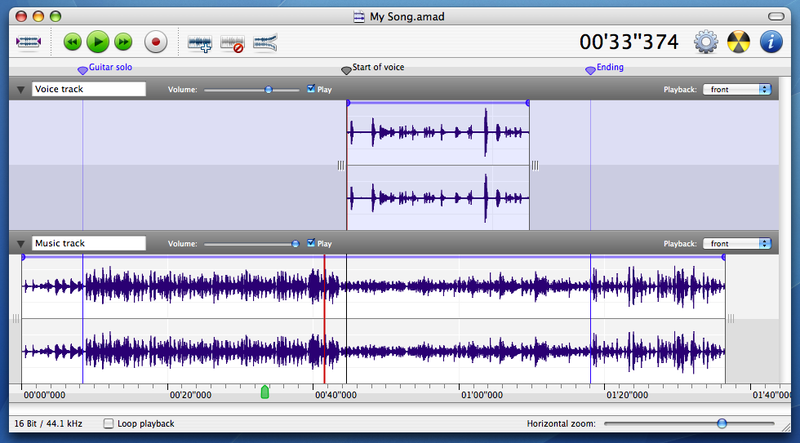 [prMac.com] New York, USA - HairerSoft is proud to announce the release today of Amadeus Pro 1.4, their flagship multitrack audio editor for MacOS X. This new version brings two brand-new real-time analysis tools, improved batch processing, better handling of multi-track documents, new key shortcuts, as well as improved performance. Amadeus Pro excels and is optimized for any audio-related task, such as live audio recording, digitizing tapes and records, converting between a variety of sound formats, etc. Thanks to its stellar direct-to-disk abilities and waveform caching, edits on arbitrarily large sounds, even beyond the usual 2GB limit, are performed nearly instantaneously. * Multitrack editing and recording. * 31 MB Hard Drive space. Amadeus Pro is a $40 (USD) shareware ($25 upgrade for existing Amadeus II users). HairerSoft is a small independent software company that distributes software written by Martin Hairer. Its main focus is the development of the Amadeus suite of audio editors.